On this date in 1940, less than one month after France’s capit­ula­tion to Nazi Germany and just 10 days after the Germans had seized Great Britain’s Chan­nel Islands of Jersey and Guern­sey off France’s Brittany coast, Luft­waffe air­craft based in France began a relent­less aerial cam­paign tar­geting the lone Euro­pean hold­out against the German jugger­naut. Adolf Hitler’s aim in the four-month Battle of Britain (July 10 to Octo­ber 31, 1940) was to destroy the Royal Air Force (RAF) Fighter Com­mand, ravage British radar defenses, and gen­er­ally pre­pare the way for Operation Sea Lion (Unternehmen Seeloewe), the Wehrmacht’s invasion of England. A German invasion force projected at 20 divi­sions strong was assembling in ports on the con­ti­nent even as Luft­waffe fighters and bombers began their aerial cam­paign of destruc­tion—which Air Marshal Her­mann Goering assured Hitler would be suc­cess­ful in a matter of weeks. The RAF dis­abused both men of that notion even as it took a ter­ri­ble beating: In just over a week, the RAF lost 106 pilots and 208 fighter air­craft, with no hope of replacing the lost planes quickly. Against the RAF’s 570 Spit­fires and Hurri­canes in Southeast England, the Luftwaffe deployed nearly 3,200 aircraft. On the night of August 25, 1940, the RAF bombed two Berlin districts, Kreuzberg and Wedding, shocking Hitler, his mili­tary coterie, and the nation. (Goering had assured Hitler that an air raid on the Nazi capi­tal was out of the ques­tion. Germans, always enjoying a rich irony, started calling air raid sirens “Meyer’s [or Meier’s] trumpets” after learning of Goering’s boast that people could call him “Meyer” [a common surname in Germany] instead of by his real name should bombs ever fall on German cities.) Out of pique Hitler ordered Goering’s Luft­waffe to retal­iate—to con­cen­trate on bombing Eng­lish cities. This was a major tacti­cal error on Hitler’s part because it meant RAF air­fields, air­craft, hangars, and barracks were no longer his main target, and as a conse­quence it allowed Britain’s mili­tary to strengthen its defenses. 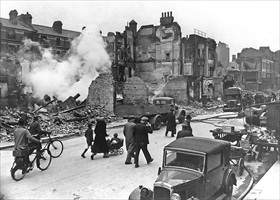 Between the start of the German “Blitz” in Septem­ber 1940 and its end in May 1941, it befell the gene­ral popu­la­tion to endure the harsh reality of German air raids, air raid sirens, sudden death, raging fires, and collapsing industrial, business, and apartment structures. The worst destruction the Luftwaffe inflicted occurred on Septem­ber 15, 1940, now known as Battle of Britain Day, the day Goering had hoped to elimi­nate the RAF from English skies. German bombers pounded the British capi­tal day and night, as well as the ports of Bristol, Cardiff, Liver­pool, and the manu­fac­turing cen­ter of Man­chester. The Luft­waffe lost 56 air­craft (bombers and fighters) to the RAF’s 26. By the time the Blitz ended with­out a German vic­tory in mid-1941—actually, it was Germany’s first defeat in the war—Sea Lion had been replaced by another ambi­tious yet equally futile opera­tion in the plan­ning stages, Operation Barbarossa, the German invasion and occupation of European Russia. 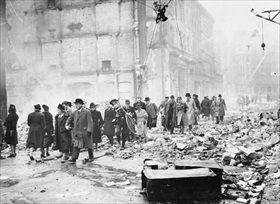 Left: Office workers make their way through a debris field as they go to work after a heavy air raid on Lon­don. During the eight-month Blitz, Lon­don suffered 71 major air raids—major meaning at least 100 tons of bombs were dropped. Other metro­pol­i­tan areas experi­enced at least 56 major air raids. All told, the Blitz cost around 41,000 lives and may have injured another 139,000. 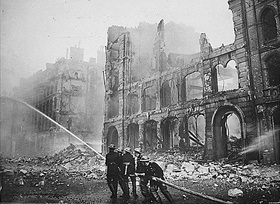 Right: Firefighters put out a blaze in London after a 1941 air raid. The Luft­waffe dropped around 45,000 short tons of bombs during the Blitz, dis­rupting pro­duc­tion and trans­port, reducing food sup­plies, and shaking Brit­ish morale. How­ever, the Germans’ hoped-for effect from their aerial cam­paign never materi­al­ized. Brit­ain was never moved to nego­ti­ate an armi­stice, nor was war pro­duc­tion deci­sively weakened. Mate­rial U.S. assis­tance more than made up for temporary war and food production shortfalls. 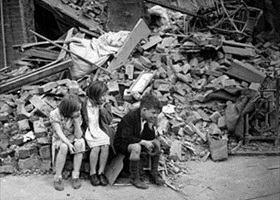 Left: Children of a London suburb, made home­less by the ran­dom bombs of Luft­waffe night raiders, wait out­side the wreckage of what was their home, September 1940. 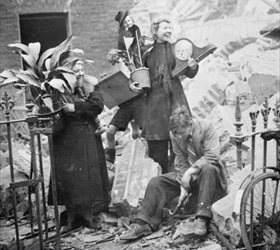 Left: Women salvage prized possessions from their bombed house, including plants and a clock. 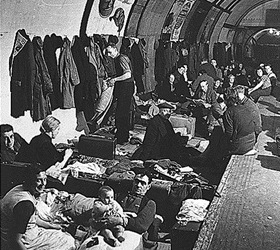 Right: A London Underground station serves as an air raid shelter during the Blitz, an all-to-common scene.